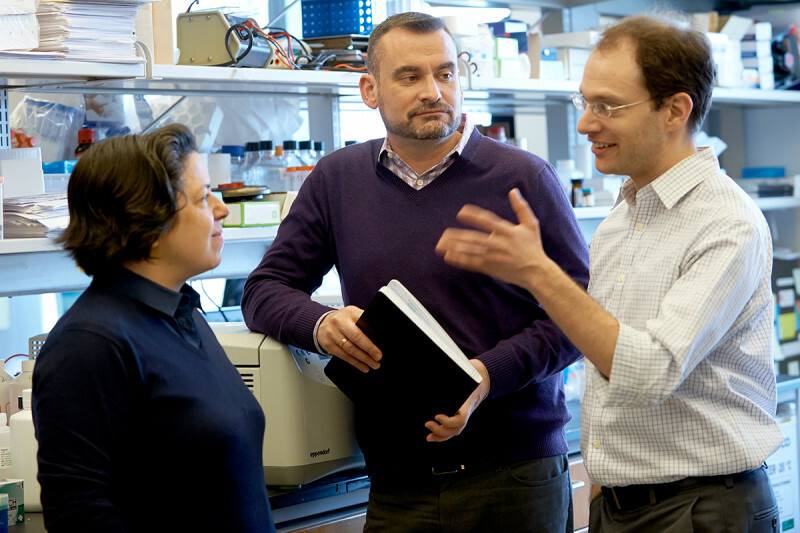 Memorial Sloan Kettering has launched a collaborative center that will unite researchers specializing in two rapidly growing fields—molecular imaging and nanotechnology. The center will speed research into the biology of cancers and augment the development of new clinical applications. Molecular imaging makes it possible to observe and measure biological processes in living cells or tissues over time — without disrupting them — by lighting them up with specific imaging agents. Memorial Sloan Kettering investigators have pioneered the development of molecular imaging methods since the 1990s — including fluorescence imaging, PET, and MRI — to aid laboratory investigations into the root causes of cancer as well as to improve many aspects of cancer care, from the initial detection of the disease to diagnostics, surgery, and drug therapy. For example, Dr. Lewis explains, “we can use molecular imaging to track the distribution of a drug or measure its activity in a patient’s body. In some cases, this allows us to ask whether a person will benefit from a certain drug.” Molecular imaging also helps clinicians learn as much as possible about a new therapy when testing it in a clinical trial. The CMINT brings together imaging experts working in many different fields. Some, like Dr. Lewis, are focused on developing radiopharmaceuticals for medical cancer imaging. Others, like chemist and engineer Daniel Heller, specialize in nanotechnology, which offers new tools for cancer biology research, diagnostics, and therapies. Still others study the most fundamental aspects of life and disease, including developmental biologist Anna-Katerina Hadjantonakis, whose lab uses cell-imaging technologies to gain insight into biological processes that drive the formation of mammalian embryos and the stem cells that can be obtained from them. The center’s faculty also includes experts in medicine, genomics, pharmacology, and other disciplines. The CMINT melting pot will incorporate a number of scientists who were part of the former Center for Nanotechnology, including Dr. Heller. “Nanomaterials have very unique and exciting properties that offer new, ‘smart’ therapies consisting of tiny particles to target drugs to cancer sites, as well as sensors for improved cancer detection,” Dr. Heller says. One of the projects in his lab is to develop medical sensors based on carbon nanotubes to detect cancer at its earliest stages. These particles measure about one nanometer in diameter — about 100,000 times smaller than the width of a human hair — and can give off light that penetrates skin. That reading was the same in January of 2015, but a recent test showed .3 today. Would molecular imaging be a way to better find where these cells are so they can be more specifically targeted with radiation? Tony, thank you for your question. According to our experts, molecular imaging — except for FDG PET/CT — is still consider experimental, and is offered only as part of a clinical trial. There is a lot of promise in using these new markers or tracers, but they are not yet established as standard nor have they clearly shown to be superior in terms of revealing the source of disease recurrence. We recommend that you discuss your concerns about your increased PSA with your healthcare team. I am attending the Cancersmart program on molecular imaging and new surgery options tomorrow evening. Are there any clinical trials with nanotechnology or molecular imaging for HER2 + breast cancer? Thank you. Judy, to see a list of the clinical trials MSK currently has open for breast cancer, you can go to https://www.mskcc.org/cancer-care/types/breast/clinical-trials. We hope you enjoy the CancerSmart program. Thank you for your comment. Dear Heba, we’re sorry to hear about your mom’s diagnosis. If she would like to speak with an expert at MSK about treatment options, she can call 800-525-2225 or go to https://www.mskcc.org/experience/become-patient/appointment for more information on making an appointment. Thank you for your comment.